It all depends what you mean by "lose weight." If you’re in a battle with your scale, cardio is the way to go. If you want to look toned in your bikini, though, it's time to get comfortable with strength training. Cardio is the simplest thing you can do when it comes to burning calories. Let’s talk science: if you burn more calories than you consume in a day, you will definitely lose weight. 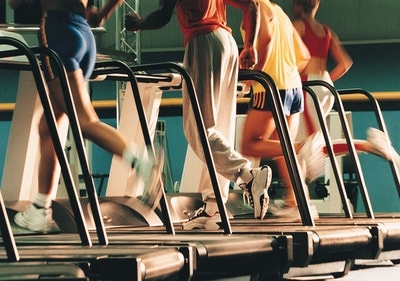 Step on a treadmill, run three miles, and you’ll burn around 300 calories. You don’t need any special equipment, have a deep knowledge of any complicated exercises, just a pair of sneakers and your limbs. That’s why most newbies just run for miles, or use the elliptical; it’s pretty difficult to mess up. Something you’re probably thinking about is how many calories you’re burning during the actual workout - that's got to count for something, right? Minute per minute, cardio unquestionably burns more calories than strength training, which could explain why, according to a recent Duke University study, compared to strength trainers, aerobic exercisers lose more weight in less time. If you do a longer cardio session, you could burn somewhere in the neighborhood of 500-800 calories, depending on the exact length and intensity level. That is a fairly decent number and will definitely help with your fat loss goals. Since you must burn off 3500 calories in order to lose one pound of body fat, if you do enough of these cardio sessions, and make sure you're not eating these calories back, weight loss will take place. The problem with this is, you are most likely to waste a lot of time, and also, most likely get really bored. In addition to that, cardio doesn't really do a lot for your muscles. For example, in a Penn State study, dieters lost 21 pounds whether they performed cardio or strength training. But for the cardio group, six of the pounds lost were muscle mass, while the lifters lost almost pure fat—and probably fit into their skinny jeans better because of it. So, while the weight training session may not burn as many per minute calories during the actual workout, the overall calorie burning benefits you receive from it typically outweigh that of cardio. Strength training is the number-one way to build more muscle. And for every three pounds of muscle you gain, you can expect to burn an extra 120 calories a day without moving a single one of those muscles, say trainers. Studies have demonstrated that after a weight training workout, the metabolism can be boosted for up to 36 hours post-workout, meaning rather than burning say 60 calories an hour while sitting and watching TV, you're burning 70. While you may think, 'Big deal - 10 extra calories', when you multiply this by 36 hours, you can see what a huge difference that makes in your daily calorie spending over that day and a half. Ultimately, all of this doesn't mean that you should retire your running shoes, especially if you're a stress eater. Cardio is one of the best ways to reduce stress. The best answer? A fitness plan that includes both cardio and strength training.